In my view, it is the failure of our present and previous constitutions to acknowledge the diversity of Sri Lanka and its inherent multi-ethnic, multi-cultural, multi-religious and multi-lingual character that has been in many ways at the centre of our failure to build and sustain the durable peace that our country so desperately needs. As a result we are restructuring our economy to encourage greater investment and increase exports. To this end, we are in the process of creating a transparent and rules-based level playing field for business, leveraging our unique geo-economic location and securing greater market access for goods and services produced in Sri Lanka. 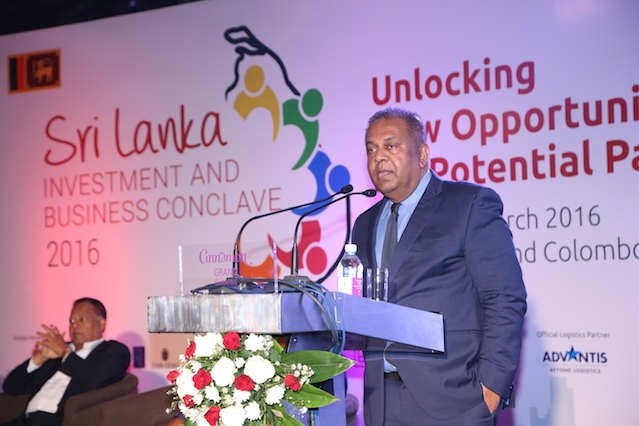 I would like to begin by commending and thanking the Ceylon Chamber of Commerce for organizing this Investment and Business Conclave bringing investors from 27 countries, including a number of Overseas Sri Lankans, to Sri Lanka at a time when the country is embarking on a new journey towards peace and prosperity. I would also like to thank the potential investors here today for placing your confidence in the possibilities that our country has to offer. Sri Lanka gained independence on the 4th of February 1948 amidst much hope and expectation. A British newspaper editorial written on that day not only predicted a bright future for our country but also went so far as to say that, given its strategic position on one of the world’s busiest sea and with an abundance of natural and human resources, Ceylon would no doubt soon become the Switzerland of the East. The comparison to Switzerland reflected the general anticipation that this newly independent island nation would be a rich and developed democracy united in its diversity. 68 years later, or if I may say so, two youth insurrections and a 26 year-old civil war later, Sri Lanka has yet to achieve that promise of hope. Many opportunities have been squandered away for reasons of political expediency. The refusal by many of our post-independence politicians to acknowledge the ethnic, linguistic and cultural diversity of our country and the lack of political courage by those who understood this reality made Sri Lanka prey to politics of extremism. The deafening silence of the moderate majority on both sides of the divide, combined with political leaders who lacked the courage of their convictions to tell the truth, pushed Sri Lanka to the precipice. On the 8th of January 2015, the people of Sri Lanka took a bold decision not to stare any longer into that abyss; they decided to pull back from the precipice and the country embarked on a new journey to win the future our people truly deserve. This journey towards peace and prosperity is based on three pillars: democratisation, reconciliation and development. These objectives must be addressed in parallel if we are to succeed. There can be no sustainable development without democracy and reconciliation and vice versa. As President Sirisena often says, development cannot only be measured by bricks and mortar alone but the hearts and minds of the people must be taken into consideration. Today the people of Sri Lanka have chosen democracy, good governance and the rule of law over authoritarianism, arbitrary rule and impunity; they have chosen stability, reconciliation and peace over the politics of fear and hate. And they have also chosen openness to the world and a competitive, transparent rules-based economy over isolationist crony capitalism. Therefore, it is on the basis of these goals that the government is building a firm foundation for unleashing Sri Lanka’s potential for the 21st Century. In my view, it is the failure of our present and previous constitutions to acknowledge the diversity of Sri Lanka and its inherent multi-ethnic, multi-cultural, multi-religious and multi-lingual character that has been in many ways at the centre of our failure to build and sustain the durable peace that our country so desperately needs. Therefore, this government has embarked on the process of creating a new, truly democratic, constitution that reflects the needs and aspirations of all Sri Lankans. The new constitution must be the flagship of Sri Lanka’s commitment to being a modern vibrant democracy united in its ethnic, religious and cultural diversity; it must also reflect our commitment to individual and human rights, as well as internationally accepted humanitarian laws. The new constitution must also ensure non-recurrence of the various tragedies our country has endured over the last 68 years. For the first time in history, the traditional rivals in Sri Lankan politics – the United National Party (UNP) and the Sri Lanka Freedom Party (SLFP) – have come together to form a grand coalition for the first time, heralding a new era of consensual politics based on a collective determination to ensure Sri Lanka’s unity and stability by building a durable peace based on equality, justice and freedom. Under this resolution, the government committed itself to a comprehensive approach to dealing with the past via the creation of four reconciliation mechanisms viz an Office of Missing Persons, a Truth, Reconciliation, Justice and Non-Recurrence Commission, a domestic accountability mechanism and an Office of Reparations. This resolution was welcomed by the main political parties, including the main minority political parties. Together with the new constitution, these measures will collectively address many of the root causes of conflict and ensure true long-term unity, stability and durable peace. And public consultations on both the constitution and the reconciliation mechanisms are already underway. However, the Government recognizes that reconciliation alone will not create the necessary systemic political stability and good governance that Sri Lanka requires. Over the last year, a range of steps have been taken to restore Sri Lanka’s democratic heritage. Last year, the Government passed a constitutional amendment which re-established term limits and restored the independence of the judiciary, public service, police and other public bodies. The days of impunity and political violence are also over: Sri Lanka recently signed the Convention on Enforced Disappearances and investigations into the countless crimes that took place over the last few years are underway. After systematic censorship and abuses against journalists, full press freedom has been restored. The Freedom of Information Act will be presented in Parliament as soon as the concurrence of all provincial councils have been obtained. But if democracy and reconciliation are to succeed, the peace dividend must be felt by all sections of society; it must trickle down from the very top to the very bottom improving the living standard of all, especially the vulnerable. The peace dividend for the unemployed youth must be greater and better job opportunities, for the housewives better living standards, for the farmers, higher prices and access to markets, for the students more schools, technical colleges and universities with better-trained teachers, for the elderly greater access to hospitals and medicine. As a result we are restructuring our economy to encourage greater investment and increase exports. To this end, we are in the process of creating a transparent and rules-based level playing field for business, leveraging our unique geo-economic location and securing greater market access for goods and services produced in Sri Lanka. We want the best the world can offer for our people. Our friendship with our sister and neighbor, India, has reached new levels of excellence in the last twelve months and Sri Lanka is positioning herself as the gateway to India and the sub-continent to share the economic benefits of one of the world’s fastest growing economies. Our historic relations with our other powerful friend and neighbor, China, are as strong as ever and next month’s visit by our Prime Minister to Beijing will further strengthen our ties. Our cordial ties with the US have now been elevated to that of a very special friendship making the US one of Sri Lanka’s staunchest friends in the international community. The US-Sri Lanka partnership dialogue bears testimony to this bond. The EU again stands ready to assist Sri Lanka’s march forward and the U.K. remains a time-tested friend. Securing the GSP+ concession seems a possibility again. Japan and South Korea [which I am visiting tomorrow] are as always rallying around Sri Lanka. Our friends in Russia and the Middle East are extending their hands in friendship and support. Sri Lanka is now at the centre stage of international relations. Along with Myanmar and Tunisia, there is a tsunami of goodwill and support developing around the globe for Sri Lanka. An unprecedented window of opportunity has opened and as Sri Lanka turns 70 in 22 months’ time, we are firm in our resolve win and overcome all the challenges which have held our nation back for so long.